This is an extremely versatile design that can be worn buttoned as either a shrug, cowl or if you prefer, unbuttoned as a scarf. The Oriel stitch is a beautifully textured lace pattern that combines yarn overs, decreases and purl stitches. These build to create a fish scale effect that begins with delicate beaded droplets at the cast on edges and travels toward the grafted centre of the design with beaded accents highlighting the centre of each motif. 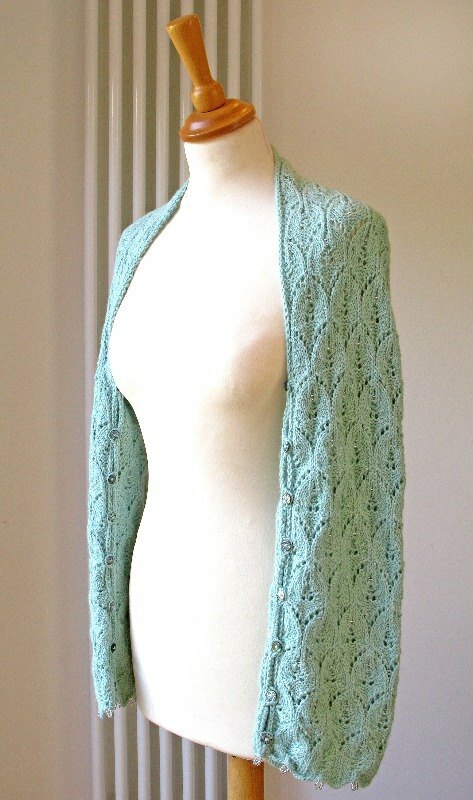 This shrug is designed to be worn with a relaxed fit which means that the buttons do not fasten near the top of the arm. Instructions are given for 4 sizes with bust sizes given as a reference only. Please refer to the table and finished measurements below before deciding which size to knit. 600 (700 ; 900 ; 1000) m [656 ( 765 ; 984 ; 1093) yds] DK weight yarn.